Mad Dog Inferno Hot Sauce owner, David Ashley, has been making products under his Mad Dog label for years. 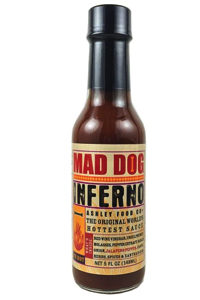 Now with, Mad Dog Inferno Hot Sauce, he has come up with a sauce that truly lives up to its name. Mad Dog Inferno Hot Sauce is raging with fire. Mad Dog Inferno Hot Sauce will blow your mind. Mad Dog Inferno and related Mad Dog's hotter limited editions which have "unnsulphured molasses" are my favorite sauces. I use it on tacos mostly. The key is the mmolasses! Ingredients: Vinegar, Unsulphured Molasses, Concentrated Pepper Extract, Garlic, Onion, Jalapeno Pepper, clove, herbs, spices and Xanthan Gum. Walkerswood Traditional Jamaican Jerk Seasoning, 10 Oz.